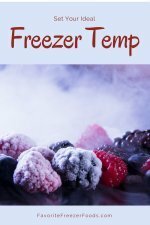 Ideal Freezer Temps for Freezing + Storing Food; They're Different. Setting your ideal freezer temperature and measuring it with a freezer thermometer is vital if you want the best results for your hard work and to keep your freezer stash as fresh as can be. Freezing food stops the growth of bacteria and micro-organisms, but does not kill them off . So if the temperature gets too warm, like when you thaw your favorite freezer meal or that perfectly marbled rump roast, bacteria will start to grow again. This is the essence of why we freeze food instead of leaving it in the fridge - so bacteria (and enzymes) don't spoil our supper. But your freezer does more than that. Freezing food at the proper temperature also preserves nutrients and slows enzymes. Enzymes are, essentially, what makes fruits and vegetables ripen, over-ripen and rot. This is why many veggies have to be blanched before being frozen; blanching, aka boiling, for long enough stops the enzymes altogether. And while nutrients in produce normally continue to deteriorate over time, freezing stops that process while maintains the nutrients in food until you're ready to dig in and eat up. A freezer thermometer is the best way to know exactly temp your food is being frozen or stored at. Amazon carries some great options with low prices. The ideal freezer temperature is 0 Fahrenheit (-18 Celsius) for all food storage. And -10 Fahrenheit (-23 Celsius) is recommended to quickly freeze food. So your ideal freezer temperature is the depends on if you are freezing or storing food. For example, if I am planning to fill the freezer after a day of shopping or freezer cooking I turn the temp to -10. The next day, when everything is frozen solid, I move the temp back to 0. Why does this matter? For every five degrees Fahrenheit above zero, the recommended storage time is cut in half. Food stored above 0 Fahrenheit loses more nutrients and loses quality faster than properly frozen food. The faster food freezes, due to lower freezer temps and being cooled to room temp or fridge temp before freezing, the smaller the ice crystals. The smaller the ice crystals the smaller the change in texture and better quality when thawed. Try to set the dial to the proper temperature 24 in advance. Why not leave the freezer set to -10F (-23C) all the the time? Because it uses a LOT more electricity to keep the freezer that cold and there is little to gain - except a bigger bill! Save energy! Keep your freezer full. A full freezer will stay colder longer, thus using less energy to maintain the ideal freezer temperature. Once frozen, foods should be grouped together to help keep each other cold. It takes less energy to keep frozen foods cold than to cool the air in the freezer. In the case of a power out a large freezer full of frozen food will keep for about two days, a half full freezer will only stay frozen for about half a day. And just in case your freezer does defrost, you should keep it well organized. The lowest part of your freezer should be raw meats, above that cooked meats and meals, then fruits and veggies and dry goods like breads on top. You can keep your freezer full by adding ice, flour, dry beans, rice or other pantry items when you have extra space. Remember, those solid masses will help keep your freezer more energy efficient and keep your food cold longer in the event of a power out. 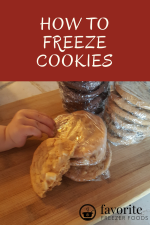 Of course, learning the basics of freezer cooking such as what can and can't freeze, how to prevent freezer burn and oxidation, and what containers to use, also helps with quality. If you want to test your freezer to see what temperature it is use a freezer thermometer. Ideally read the thermometer after the freezer door has been closed for quite awhile, like first thing in the morning, so you get an accurate reading. Freezer alarms are another solution you may have heard about. And a freezer alarm that monitors the temperature in the freezer and lets you know if it gets too warm is a great investment. - live somewhere with rolling power outs or power outs due to extreme weather. -over-stuff the freezer so the door doesn't always close. MYTH: A freezer that is too cold causes freezer burn. Temperature does not cause freezer burn. Freezer burn is the dehydration of your food by air. The moisture leaves the food, entering the air in the freezer. Proper moisture-vapor proof freezer quality storage containers are key to preventing freezer burn. While we're talking about food safety and temps let's talk about the ideal refrigerator temperature, 35-40 F (1.8-4 C). This range slows the growth of bacteria without the risk of freezing foods. Regardless of what anyone advises in terms of saving electricity, do not turn your fridge thermostat any higher than 40 F (4 C). The danger zone is the range in which bacteria in food can grow. The temperature range is 49 F and 140 F (4C and 60C) and food kept in this range for more than four hours should be thrown away to prevent food poisoning and other illnesses. Return from Ideal Freezer Temperature to the homepage of Favorite Freezer Foods. Your ideal freezer temperature varies. 0F (-18C) is not best for freezing food, especially warehouse shopping, preparing freezer meals, preserving garden produce.